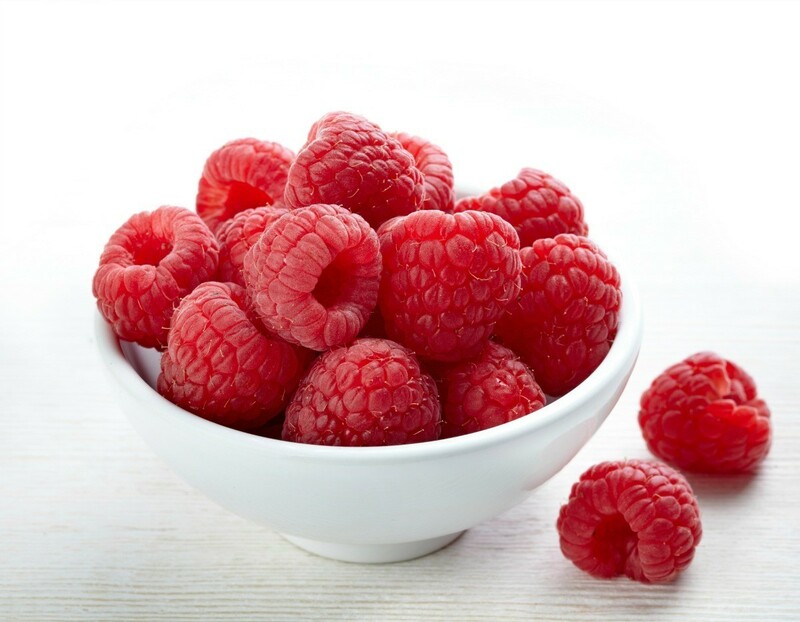 Raspberries are delicious when used in a variety of desserts and other recipes. This page contains recipes using raspberries. This fast and easy soup is quite tasty! For those of you who love raspberry vinaigrette on your salad or fresh veggies, you'll love this soup! The yogurt is a healthy substitute for sour cream. *Vegetarians substitute soy sauce for bullion. Put all ingredients in large stock pan, and add about 3 cups of water. Cook on med-high until veggies are done. Lastly add the bag of frozen raspberries and cook until they are hot. Then add the yogurt and stir. If your family isn't game for something a bit unusual like this, just make the plain veggie soup for the picky eaters, then in a separate bowl add about a tablespoon of plain yogurt and a tablespoon or so of raspberries to your bowl, then microwave until it's hot again. For a quick meal later on, I like to scoop the soup into zip-lock baggies using a coffee cup. I then freeze these individual portions by laying the baggies flat and stacking them. Be sure to push all the air out of the zip-locks! Later on, I'll thaw out the soup if I have time or if I'm in a hurry, I'll put baggie with the frozen soup into microwave and cook it for about 1 minute (to partially thaw), then it will be easy to remove the frozen soup from the baggie and squeeze it into a bowl to microwave. In top of double boiler, place the milk and marshmallows to melt. Cool. Whip cream, add flavoring and fold into marshmallow mixture. Gently fold in the raspberries. Mix graham cracker crumbs and melted butter or margarine and press into an 8 inch square pan. Pour in the mixture and chill. As you can see, other fruits and flavorings can also be used in place of raspberries. Prepare one recipe graham cracker crust. Press most of it in a 9x13 cake pan. Whip 1 cup whipping cream, fold in 1 cup marshmallow creme. Add 1 cup or more fresh sweetened raspberries or drained canned raspberries. Pour this mixture into prepared crust. Sprinkle with remaining crumbs. Chill thoroughly. Does anybody have any good dessert recipes using black raspberries? I have a bumper crop of them this year. Put any amount of black raspberries in a large bowl or non-aluminum pot. Add white vinegar to just cover the berries, let stand 24 hours. Bring to a boil; strain. Measure juice and add an equal amount of sugar(ie a cup of sugar per cup of juice). Boil for 20 minutes Pour into hot, sterilized jars and seal OR pour into containers, leaving an air space and freeze. To serve, place 2-3 large spoonfuls of syrup(or to taste) in tall glass; add cold water and ice cubes. Stir. Yield: The final volume of syrup will be about half the original volume of berries. My Mother used the same recipe for just about all fruit. It is called "No Fool Cobbler". To make it you melt 1/2 stick of butter or margarine in 8 by 8 cake pan. Mix together 1 cup of self rising flour, 1/2 cup sugar, & 3/4 cup milk by hand. How lucky you are to have such a good crop,,mine aren't doing so good this year. My grandmother always made a family favorite, sort of cobbler but on the stove. Cook berries with sugar, never knew her exact formula but was about 2 qts berries with 2 cups sugar. She then made a biscuit only rolled almost flat, cut in small pieces and dropped into thickened berries and slow cook until dumplings were done. Although I make the occasional blackberry pie with our crop, our standard blackberry dessert is extra simple, but very delicious. We simply sprinkle a nice handful over a bowl of Dannon's Lowfat Vanilla Yogurt (available in a large blue and yellow tub, enough for 6-8 bowls at least). We've tried other brands of the lowfat vanilla, but they just weren't the same as this brand. It has a great flavor that goes perfect with the raspberries. It's perfect for me too. Lowfat and no turning on the oven in a home with no airconditioning! I have an idea --- send them to me!!!!!! You could come to my house with a hot blackberry crisp! I never miss making one. Blender half the berries with some cornstarch and sugar and cinnamon, toss into pan, add the other half the berries and stir, then top with mixture of equal parts oatmeal/butter/brown sugar with half again the amount of oatmeal. Bake over a cookie sheet until unbearably wonderful smells fill kitchen. Can you tell I'm not a precise measure type of cook? Enjoy your berries, you lucky lady! They can be substituted in any recipe that calls for red raspberries. My favorites are a pie, homemade jelly, and smoothies, but I chiefly just like eating them plain. My grandfather made an absolutely wonderful raspberry wine. Freeze the extras to use throughout the winter. You can also use them to make a fabulous syrup to use on pancakes, waffles, over ice cream, or on cake. Mix a large tub of coolwhip and 1 package of cream cheese until smooth - add as many raspberries as you want. This is very simple and very good!! Melt butter in a 2-qt. baking dish. Combine flour, sugar and milk. Pour into the dish with the butter. Pour blackberries over the batter; do not stir. Bake at 350 for about one hour. I use Pillsbury dough (in the refrigerated section of the grocery store) in a red box. With this I use to make my crust, along with 1/2 to 3/4 c. of sugar, 3 tbsp. of flour, and 5 c. of raspberries to make my homemade pie. I bake at 325 to 350 to prevent the crust from burning, for an hour. After an hour or so, I serve it with vanilla ice cream. The reason the sugar amount varies, depends on how sweet the berries are.